1.Immerse plank in warm water as label directs. Prepare outdoor grill for direct grilling over medium-high heat. 2.Coat corn and jalapeños with 2 teaspoons oil. Place corn and jalapeños on hot grill rack; cover and cook 5 minutes, turning frequently to brown all sides. When cool enough to handle, cut corn from cob. Cut jalapeños lengthwise in half; with knife, scrape out seeds and veins then finely chop. 3.In medium bowl, toss onion, cilantro, lime juice, 1/2 teaspoon salt, chipotle powder, corn and jalapeños. Makes about 2 cups. 4.Place salmon, skin side down, on plank and rub remaining 2 teaspoons oil over top; sprinkle with remaining 1/4 teaspoon salt and brown sugar. 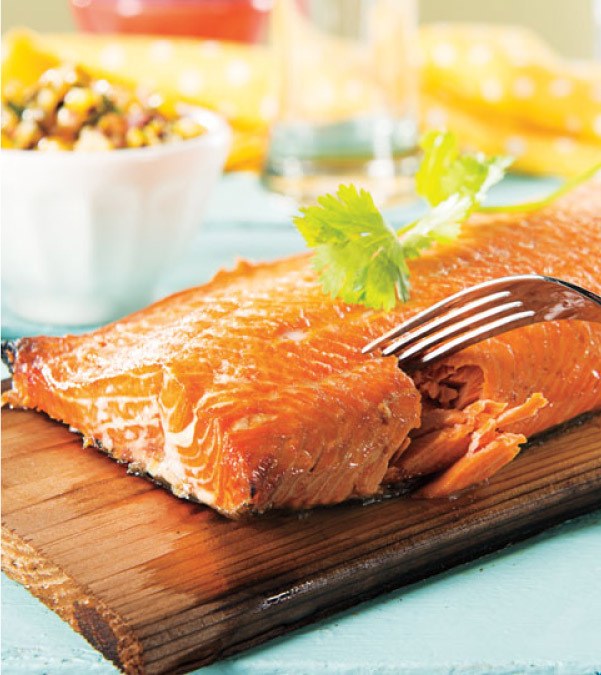 Place plank with salmon on hot grill rack; cover and cook 15 to 20 minutes or until salmon turns opaque throughout and internal temperature reaches 145°. Drizzle salmon with lemon juice and top with salsa to serve.